Roofing systems are impacted every day by exposure to the sun and the weather’s temperature changes. It shows up in different ways – fasteners backing out, panels peeling back, splits and cracks in the membrane, etc. You may think that you need to replace your metal roof if these signs start showing up, but replacing a roof is an expensive and time consuming endeavor. 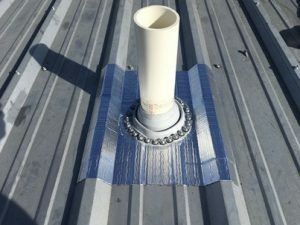 We can save you a lot of money and time with our unique commercial metal roof restoration process by keeping water from ponding or pooling, and seamless protection against the sun’s rays and extreme elements. Our restoration process will greatly expand your metal roof’s lifespan. It’s less intrusive and expensive than a full roof replacement, but it’s still a major project. Before you have to invest big money in replacing your roof, our highly trained crew will find and fix all of your roofs issues. Metal roof restoration is our unique specialty, and can save you as much as 50% compared to the cost of replacement. Metal roof restoration requires a special skillset and level of experience that very few commercial roofing contractors possess. It’s a process we have mastered and we have become one of the country’s leading authorities. We have over 20 years of experience and have worked with many property managers, facility managers and building owners across a wide variety of industries. We’ve earned the moniker “The Roof Restoration Experts” through our dedication to our customers needs and a never ending quest to improve our unique process and educating our customers about their choices for saving money and time. It’s a very dependable system backed by extendable warranties and saving our customers a lot of money over the life of their roof. Over the years, we’ve performed our restoration system on many buildings. Ask yourself this – why should I waste a lot of my business’s hard earned revenue on replacing our metal roof when there’s a system available that will cause much less disruption in our daily operations and save as much as 50%? We’re more than happy to supply anyone with references from past satisfied customers upon request. We have great crews and applicators that are the backbone of our great products and systems. And, our vast, experienced applicator network makes our unique process available almost anywhere. We employ a comprehensive applicator training program that benefits all of our customers and not just our contractors. We feel that our technical service team is the best there is. Closing down your property or building while the work is being done is one of the unfortunate realities when you’re replacing your roof. This can cost you a lot of time and expense while your operations are interrupted. You could just repair the localized issues instead of replacing your roof, but this is just kicking the can down the road. If there was a better, more permanent and economical solution, why wouldn’t you choose it? Like all roofing systems, metal roofs and their owners, as they have become more and more popular, are looking for ways to keep their roofs from deteriorating too quickly in the face of severe weather and the sun’s relentless rays. You can cool your property below, helping with energy expenses, by utilizing our metal roof restoration process to fix your leaks and help your roof to reflect more of the heat and the sun’s rays. One of the big reasons that building owners and managers choose metal over other roofing systems is its long lifecycle. But, just because it has a long lifecycle doesn’t mean that it won’t have its own maintenance issues. All roofing systems are affected by the elements, and metal roofing is no exception. Your metal roof will inevitably deteriorate and develop problems without a routine maintenance schedule. Because rust will begin to form as soon as the coating on your metal roof starts to break down. By the time water is coming in to your building, it could be too late to avoid a replacement, depending on the level of degradation thats occurring. The main areas that you should focus on to find your roof’s vulnerabilities are the fasteners, vents, flashings, ridge caps and penetrations. One issue that metal roofs are especially susceptible to is lift up from severe wind storms. Where you have screws or nails fastening the roof panels to the structure is another area where water and wind can wreak havoc with your building. So, when your metal roof is showing signs of failure – stress, leaking and rust – you have another option instead of an expensive roof replacement. 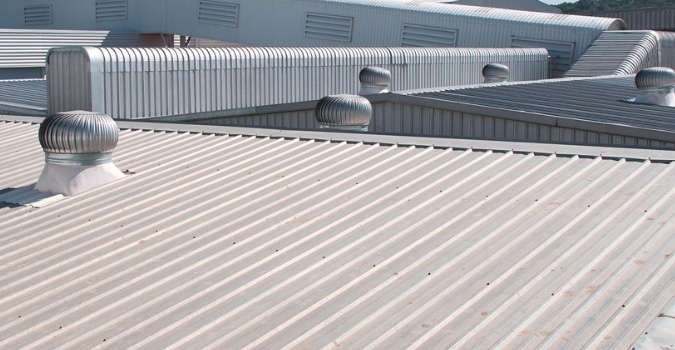 You can make the choice to go through our commercial metal roof restoration process, saving you considerable time and expense. Choosing the right restoration products and company to do the application are critical to ensuring that your restoration process is completed successfully. Here at Taurus Elite Commercial Roof Systems, 512-332-4422, we’ve been providing commercial roofing services to Austin, Texas and the surrounding area for over 20 years. This includes commercial metal roof repair, commercial metal roof restoration and commercial metal roof installation. If you need a trusted, experienced company to answer questions you may have about the commercial metal roof restoration process for your roof, we’re waiting for your call.